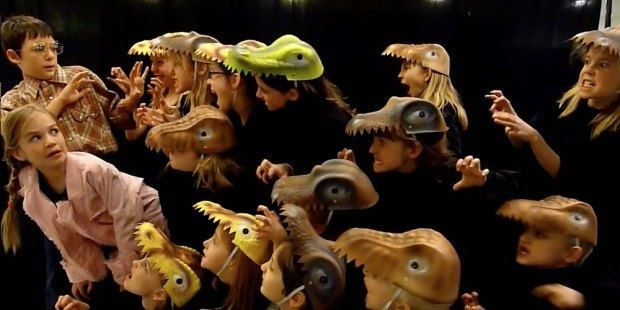 Arizona Onstage Productions - (Award winning professional theater company including their record breaking production of Les Miserables) join forces to bring a summer camp for students who want to sing, dance, work on their character development through acting training, design and construct costumes and sets for the Tucson Premiere of the musical Magic Tree House - Dinosaurs Before Dark this summer! We will also have improvisation games/workshops, video TV commercial making classes, and character makeup classes covering everything from monsters to magical looks. You don’t have to be familiar with the book to start camp. Location: KU Studios, Home of Kids Unlimited – 6066 North Oracle Rd. All supplies, costumes and snacks are provided. Students should bring their lunch. More information: The ratio of students to teachers for this camp is 1 to five, assuring personal and specific attention and care for each student. Adults are professional teaching artist with level 1 FBI Security Card clearance. We are limiting each session to 20 students. What would you do if a tree house in your neighborhood could transport you anywhere you wanted to go? The audience joins you on the trip filled with fun songs, amazing costumes, special effects and great roles for everyone. …While exploring one afternoon, siblings Jack and Annie discover a tree house full of books. Jack looks through a book about dinosaurs and wishes he could see a real one. Suddenly the wind begins to blow and the tree house starts to spin wildly. When it finally stops, Jack and Annie open their eyes to find they have been transported back to the time of the dinosaurs. Join Jack and Annie on their adventure back in time to experience an amazing group of dinosaurs face to face. Magic Tree House: Dinosaurs Before Dark is an adaptation of the first of Mary Pope Osborne's award-winning fantasy adventure books from the Magic Tree House book series. The books are number one New York Times bestsellers - more than 100 million copies have been sold in North America alone. The series has been translated into many languages and is available in more than 100 countries around the world. This show is licensed through Music Theater International of New York City. Special Offer, Good till May 15th.